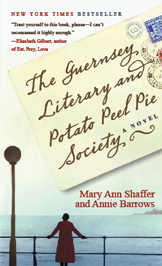 The Guernsey Literary and Potato Peel Pie Society » Last Essay Winner! « Essay Winner – Week 7! It was my first trip to Toronto, but the city was stunningly familiar. My husband and I took a city tour on a Hippo (land and water vehicle) on a perfect summer day. We drove past the Fairmont Royal York hotel. My antenna rose excitedly seeing the beautiful old hotel. I elbowed my husband in the ribs. He still had his eye out for the Hockey Hall of Fame. He folded up his city map, and took a look back at the hotel. In this case, Richard and Iris Griffen, main characters from the book The Blind Assassin by Margaret Atwood. But I had forgotten that they were fictional — they were as real to me as anyone I knew. As I toured through Toronto for what should have been the first time, I was touring with the influence of all of the Atwood books I read and loved. Which places and people reminded me of Cat’ Eye, which of The Edible Man? Which character worked at the Royal Ontario Museum? Where was that great salon near the university? I had that same feeling that I have sometimes when trying to remember properly a story my Grandmom told me about an event when she was growing up. If only I had listened more carefully, I would know so much more! In the same way that I cannot help walking through the city of Baltimore looking for Anne Tyler’s people and places (who among us would pass up the chance for dinner at the Homesick Restaurant? ), it was impossible for me to see Toronto without seeing and hearing Atwood whispering (or sometimes yelling) in my ear. I have yet to send Richard and Iris their wedding gift — and as it turns out, that marriage did not turn out so well. But Atwood had given me, without me even thinking about it, the gift of some of her vibrant city of Toronto. And I am a grateful recipient. When the Hippo landed, my husband asked me if there were any real or fictional bars I could recommend in the area. I chose not to tell him about The Toxique from the The Robber Bride — but I would have definitely stopped in if I had passed it. This entry was posted on Wednesday, October 28th, 2009 at 12:39 pm	and is filed under Uncategorized. You can follow any responses to this entry through the RSS 2.0 feed. You can leave a response, or trackback from your own site.